Is it snowing in Riederalp - Aletsch ?Thank you! Riederalp - Aletsch in Switzerland (in the Valais region) is a medium sized ski resort with 9 ski lifts (2 chair lifs, 4 surface lifts) that offers skiers a respectable 447 metres (1467 feet) of vertical descent. Riederalp - Aletsch has 34 pistes with a total length of 99 kilometers (62 miles). Riederalp - Aletsch is best suited to beginner skiers and snowboarders but there is some terrain for both expert and intermediates. There are 1 kilometers (0.6 miles) of cross country ski trails at Riederalp - Aletsch. For snowboarders, there is a terrain park and a half pipe. A small proportion of the pistes at Riederalp - Aletsch are covered by snowmaking. The nearest airport is at Geneva. Almost every Christmas I spend the holiday in Fiesch in the Aletsch region with my family. Fiesch, Fiescheralp, Betmmeralp and Riederalp have many not too expensive chalets for rent, ideal for families. 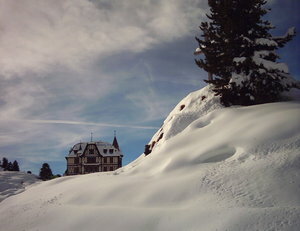 The villages are charming and snow covered, breathing Swiss tradition. Don’t expect a thrilling night life. The Alps and the great Aletsch gletscher are UNESCO protected, securing a beautiful environment for the future. The panoramas are one of the most beautiful in European Alps. Since the UNESCO status, no new lifts have been opened, but the capacity and quality of the existing lifts has been increased during the last years. A good connection lift between Bettmeralp and Kuhboden (Fiescheralp) is lacking and the slopes are for good skiers only. When the red Aletsch piste in Bettmeralp is closed, you have to take a few small lifts to get in Riederalp. Also within Riederalp slopes are not good connected. Especially for snowboarders this can be annoying. The ski area has some exciting runs. You can ski from the Eggishorn (2900 metres) to Fiesch (1050 metre), a drop of almost 2 km with steep slopes and a controlled off-piste route. The real pros can take a steep freeride route from the top with their own security equipment. Another experience is the steep, but short, slope after skiing through a 100 meter skitunnel from the Bettmerhorn. You can choose to ski off-piste to Bettmeralp. In Riederalp sometimes a slalom run is opened, the one in Fiescheralp is for groups only. After a good dump of snow, the young locals know, you can descend from Bettmeralp and Riederalp into the valley. These are freeride routes and not on the map. 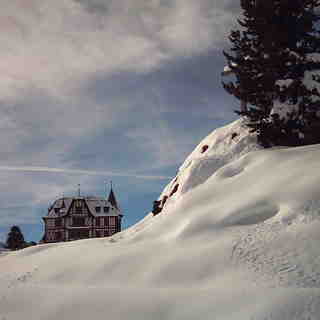 With the Aletsch ski pass you can visit Muhlebach near Ernen. This calm and tiny area only has four lifts, but with nice red runs and off piste possibilities when the off piste snow in the Aletsch area already has been packed by an overkill of skiers and boarders (in the holidays). It seems the Swiss are trying to avoid risk (more than the French do). This area is missing a proper fun park with a lift. In Fiescheralp, there are some cheap and badly groomed plastic slides with scratches on the surface, a cheap rainbow and some badly shaped jumps. In Bettmeralp there are three jumps of a quality far below international freestyle standards. The slope control doesn’t like people building their own kicker. Sometimes I ended up confused when lifts are closed due to “bad weather”, despite perfect snow conditions. The Aletsch area is not for freestyle. Great for families. Also expert skiers can have fun!